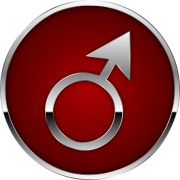 Mars symbolises thrust; it is masculine in its direction of operation, has minimal sensitivity and maximum ego-projection; its purpose is to claim. Once worshipped as God’s warrior aspect, men would hone their qualities of courage, honour and skill in their prayers. When sacredness is denied or falls into forgetfulness the warrior principle shows its dysfunctional expression as a soldier, whose belligerent anger serves worldly, political purposes; this takes place because he shirks personal responsibility by looking to an outside authority for his own discipline. Then bullying occurs. In a horoscope, Mars shows how, by taking affirmative action, we externalise our feelings into the world, and also how we avoid imposition by using the fight or flight instinct. Its association with the sign of Aries and its related qualities is very informative. Mars likes to be first, and fiery. If a warrior strikes quick and hard then his position is asserted definitely and with minimal force expended. Any time spent in contemplation increases the risk of failure so trained spontaneity is rewarded – provided the training has eliminated rashness and emotionality. Courage and certainty of action are indicators of a highly developed Mars energy; ambivalence and anger indicate the opposite. It is useful to consider four distinct levels of development for this rather dangerous form of self-projection. If this energy is erroneously directed inwardly, then we can ‘beat ourselves up’ and engage in self-harming behaviour; depression results. The second level, although better than depression, is also dysfunctional; it is aggression. This inescapably results in being attacked subsequently and so is wasteful since energy will be required for defensive purposes. The third level is assertiveness, which creates effective outcomes in the world when properly directed. At its highest level of operation, Mars is devotion. Whether devoted to a task, a person or a principle, the self is no longer in high relief and so another, higher force can be engaged. Spectacular results are then achieved. Together with Venus, Mars has the role of creating sexual outcomes. Contrary to popular fiction, it is Venus that initiates sexual encounter. Mars is devoted to his path of achieving an independent, self-serving outcome – until Venus wags her tail feathers at him; then she becomes his goal, and he thrusts towards her against whatever resistance he might encounter. He might be the charming diplomat, ardent conqueror or even an ape with a wooden cudgel – but to win his mate he must surrender his independence of manner and indicate his complete unreserved devotion to win this particular woman, otherwise she will not respond. The principle applies in the more worldly sense too – we must go for one thing and only one thing if we are to achieve success. Mars is the focus of our attention – which must be single or it is actually not focused and therefore cannot be effective. Mars has strong associations with Scorpio, its historical ruler. This speaks more to its quality as defender rather than protagonist. Many of us have no inclination whatsoever to fight – until home and family are threatened. Then we stick in our heels and grit our teeth, ready if necessary to die in order to protect those we love deeply. We get the true measure of Mars’s emotional depths then – it is not superficial, it is of the essence, that which awakens and empowers the hero within us, which transforms our identification of self to the higher realms, transcending the ego and serving devotional principles. The secret of sexual reproduction lies in the ability of a sperm to penetrate the egg, having defeated many other competitive suitors. Human life itself therefore depends upon this Mars-type urge to complete and penetrate against defensive shields. It is not subject to permission or civilisation’s code of conduct; it is the raw, natural animal instinct to reproduce in service to the utmost urgency of survival. And yet, civilisation itself depends upon this urge being constrained within the disciplines laid down by society’s code. Therefore fully to optimise the appropriate realisation of Mars requires the exceptional skill of controlling strong passion. Thus we have the martial artist, the Olympic medallist, the business executive and the politician. All train themselves through masterly discipline to control and use, rather than suppress, their passionate ambition to be better than others and have their own way become a dominant force.